Hello all, thanks for adding me to the forum. My interest is in firenza or magnum coupes. 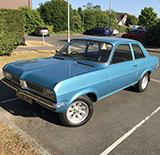 My dad bought a firenza 2.3 SL sport new in 1973. I've loved them ever since, my first car was a firenza which I fitted a 2.3L engine to. This was when there were plenty of cars and parts available. Now that the mid life crisis is in full swing my thoughts have turned to owning one again. Hello Fred and thanks for the information. I'd just missed out on a firenza droop snoot replica on ebay. Probably over cautious on my part. Will keep an eye out on the sites you suggest. Thanks again for the warm welcome.